For the past three years I have poured my heart and soul into bringing you a book that could transform your life, the way you work and live and even what you believe about yourself. Well, I’m excited to let you know that today is the day! My book, Your Brilliant Un-Career: Women, Entrepreneurship, and Making the Leap, is free on Amazon. Grab it here while it’s free! My launch team and I have worked around the clock to get ready for this launch, but yesterday I needed to get out into the sunshine and enjoy being with friends and my kids at our annual homeschool Xmas Fair. Many people expressed surprise that I was there at all… I mean “aren’t you launching a book tonight?” they asked. Yes, but life is for living and having the freedom to bake shortbread and spend a magnificent day with friends and family in the sunshine is what it’s all about hey! I’d never really stopped to think about the fact that this book could inspire women to never get on the corporate ladder in the first place. Imagine a world where our daughters never felt overlooked for a promotion, never had to play politics and never had to feel like they were put on the mummy track. One of my friends, Sally, said to me today that she felt the book is perfect for women who haven’t yet entered the corporate realm. She told me about a young marine biologist she recently met who is looking to forge her own path but doesn’t know how to go about it…. enter Your Brilliant Un-Career! This is what the book is for–to show women how to go about creating their paths and to inspire them to believe they can. Stories like these are why I wrote this book. You could continue to live a half life, following another person’s dream or path, or you could take matters into your own hands and do your dream into being. You are capable, wise and talented. 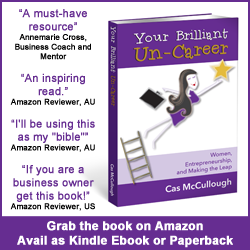 Your Brilliant Un-Career is a no-holds-barred look at life on the other side of the corporate ladder. I don’t pretend it’s easy, and I don’t show perfect examples of successful women sipping pina coladas on the beach while their minions do their bidding (although quite a few featured in the book are highly successful). No, I show the reality, but what I hope you will see is that the reality is worth it!